Sloopin - A South Loop Blog: 48 Story Residential High-Rise Coming to Vacant Lot at 1320 S. Michigan? 48 Story Residential High-Rise Coming to Vacant Lot at 1320 S. Michigan? 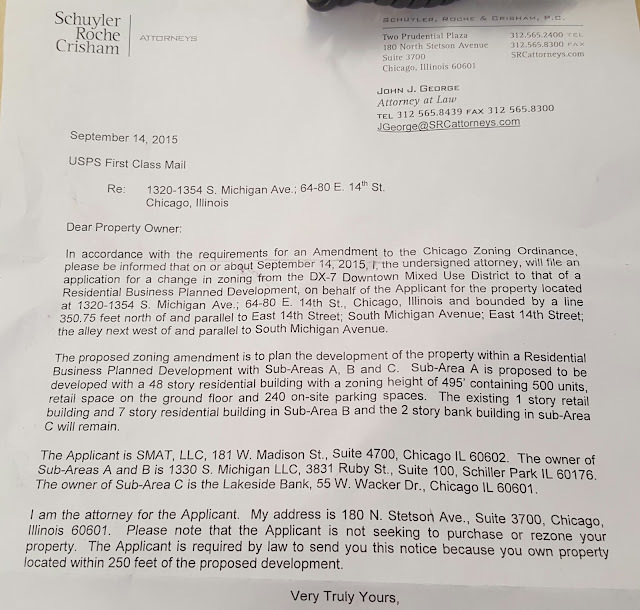 Vacant lot at 1320 S. Michigan to be developed into 48 Story Residential High-Rise? The proposed zoning amendment is to plan the development of the property with a Residential Business Planned Development with Sub-Areas A, B and C. Sub-Area A is proposed to be developed with a 48 story residential building with a zoning height of 495' containing 500 units, retails space on the ground floor and 240 on-site parking spaces. The existing 1 story retail building and 7 story residential building Sub-Area B and the 2 story bank building in sub-Area C will remain. This is the first we're hearing of this vacant lot getting developed. It seems like every week we're hearing about a new high-rise or development that's coming. Does this seem familiar to anyone else (ahem early aughts)? Regardless, it's exciting. More and more units, presumably means more and more people and more and more businesses (yes we used more 6x in that sentence). It appears that the applicant is SMAT, LLC. We did some googling but didn't find much. Anyone have any additional scoop?